This picture for me captures the spirit of Joplin. It's a boat IN A TREE! It shows the amazing power of the storm, to pick up a boat and securely wrap it around a tree. 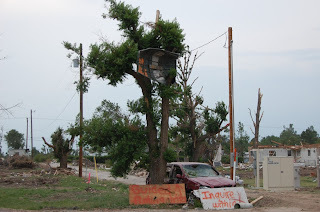 But the signs on and below it show the miracle of the human spirit (the phrase on our volunteer bracelets), to pick up and rebuild with courage and even a little humor. In this awful storm, lives were lost, plus homes, businesses, jobs, and property, but people are recovering and rebuilding, and yes, even laughing.